This knife happens to be a combination of the famous, unique and successful features of some of the new kukris.. It is one of the many recent additions to the vast and unique collection of KHHI. The knife is named so because of its special extra characters unlike commoners with the blade measuring a solid 15” in length. 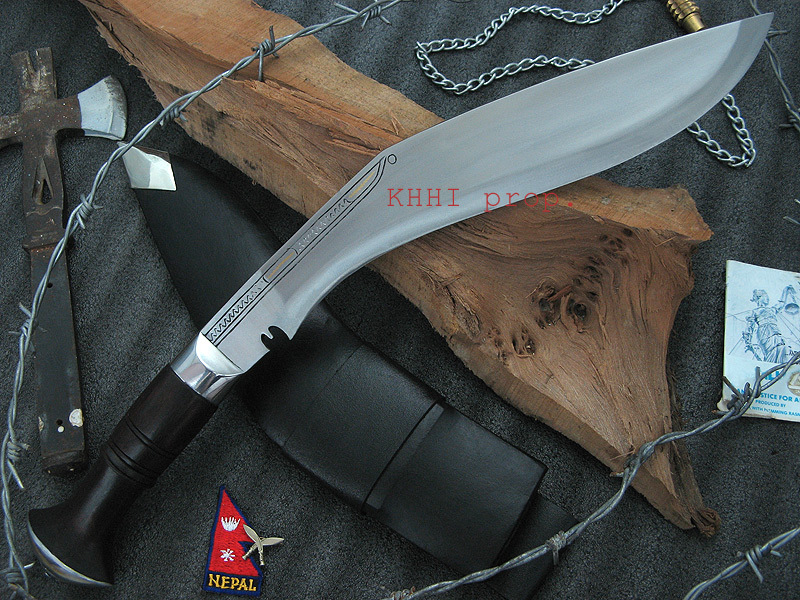 This knife actually happens to be a combination of the famous, unique and successful features of some of the new kukris made by KHUKURI HOUSE HANDICRAFT INDUSTRY. Also known as the “Kukri Machete” or “Kukri Bushman” in the world of knives, this exceptional piece of sheer power and real craftsmanship will make any opponent or enemy kneel down in front of her master. Blade: basic “World War” type (old Gurkha version), more coverage, bigger, better, longer yet easier, high carbon unpolished. Handle: “Chainpure” village type Indian rosewood handle, better and wider grip, easier in handling, metal pommel and bolster for more strength and smarter look. Scabbard: Normal flat water buffalo leather, easy/swift in and out drawing, single loop 2mm frog, lanyard loop for thigh leather string/cord. Size of blade: 15 inch approx. All is perfect. The knive is marvellous. Very good and nice job. Thanks the tram very much. Hello, I just received my khukuri and am overjoyed with the knife, it is a true work of art. Unfortunately the scabbard is short. With the khukuri in the scabbard the point rests on the bottom and an inch of ricasso still protrudes. If I were to go on an hour hike with this knife I would return with an inch of point sticking out the bottom of the scabbard, it would ruin the scabbard. Also the blade is very loose, wobbly in the scabbard. I purchased this khukuri from your Canadian Depot and it arrived in 6 working days. The knife is breathtakingly beautiful, so well made. I am very happy with it but is there anything that can be done about the ill-fitting scabbard ?